On an historic, stately stretch of Fifth Avenue, a proposal by a Brazilian developer for a luxury high-rise is threatening to disrupt the peace.Residents of two Central Park-facing buildings, at 812 and 817 Fifth Avenue, are gearing up to fight a structure planned for 815 Fifth Avenue that they described in a letter to fellow residents as “contemporary” and “incompatible” with the character of the neighbourhood, The Real Deal has learned. Paperwork filed with the Department of Buildings calls for a 15-story building with a dozen apartments as well as partial demolition of a six-story building, which records show is the oldest structure on Fifth Avenue between 59th and 110th streets. JHSF Participacoes S.A., based in Brazil, is named on renderings of the project, although the official documents list the developer as Eight Hundred and Fifteen Fifth Avenue, a limited liability company. JHSF has developed more than 19 million square feet of real estate in Sao Paulo. Brazilian banking magnate Sergio Millerman, the former CEO of Safra National Bank of New York and a consultant to the Safra Group, the Brazil-based international banking empire, is named in official documents as an adviser to the project. A spokesperson for Millerman told The Real Deal that the owners of the project are “highly sensitive to the history of the area” and will proceed in a manner that is “consistent with that sensitivity.” While the spokesperson confirmed that Millerman is assisting the developer on the project, he declined to comment on the identity of the developer. The board of managers for 817 Fifth Avenue sent the Feb. 13 letter opposing the project to both residents of both their building and 812 Fifth Avenue. The letter called for the residents to speak out against the development at a community board hearing last night. The developer presented the proposal Feb. 11 to Community Board 8′s Landmarks Committee, an advisory panel. The Landmarks Committee unanimously rejected the building, calling it “incompatible with the character of the block,” the letter said. The project can still move ahead, however, if the Landmarks Preservation Commission signs off on it. While a spokesperson for the Landmarks Preservation Commission could not comment directly on the project, which is in an historic district, she said any new building within such a district should be “consistent with the height and shape of the other buildings in the district” in order to obtain necessary approvals from the LPC. “Whether it is a contemporary design or a contextual, more traditional design, the façade composition, scale, materials and details should have some relationship to the buildings in this historic district which can be abstract or literal,” she said. Residents on the upper floors of 812 and 817 Fifth Avenue are concerned the proposed development will block their views, bringing down their property values. At 817 Fifth Avenue, the views are to the south; residents of 812 Fifth Avenue look to the north. 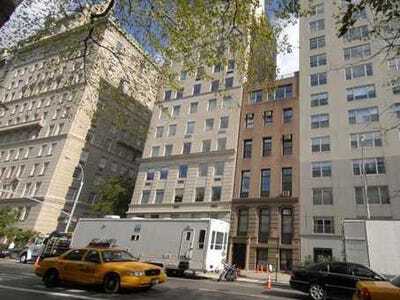 Jewelry designer Janet Yaseen, a resident of 812 Fifth Avenue, said residents of her building stood “shoulder to shoulder” with residents of 817 Fifth Avenue in the dispute. The building on the site, designed by Samuel A. Warner, went up in 1871. Once a single-family home owned by hotel owner James Stewart Cushman and wife Verna, the brownstone today houses 12 apartments and two offices. Real estate investor Robert Haskell sold the building to JHSF last year for $32 million, public records show, $7 million over its asking price. Both 812 and 817 Fifth Avenue have been home to celebrities and the city’s biggest power players. Actor Richard Gere, business magnate Steve Wynn and socialite Courtney Sale Ross have lived at 817 Fifth Avenue; New York Gov. Nelson Rockefeller and his wife, Mary “Tod” Rockefeller, had a home in 812 Fifth Avenue.